Experts recommend that adults get at least 150 minutes of moderate exercise per week to maintain a healthy weight and improve heart health. If you are trying to lose weight or gain muscle mass, that time and intensity might need to increase. According to a study released by the Centers for Disease Control and Prevention, almost 80 percent of adults do not meet recommended guidelines for physical activity levels. Research has shown that participating in regular physical activity can reduce your risk of obesity, heart disease, and other complications. So if exercise is so beneficial, why do so many adults skip over it? One of the biggest reasons is they simply feel as if there is not enough time in the day. Between work, kids, errands, and maintaining a social life, finding time to hit the gym can seem impossible. However, there are ways to make time to sneak in exercises or even get to the gym for an intense fitness class. Continue reading for some tips on just how to do this. Booking a spot in a group exercise class or with a gym trainer is one of the best ways to make time for exercise. We don’t want to guilt you into anything, but if you reserve a spot in a class and don’t show up, you’re taking a spot away from someone else who wanted to be there. Additionally, if you pay for an exercise class or a personal training session, then it would be a waste of your hard-earned money to bail. 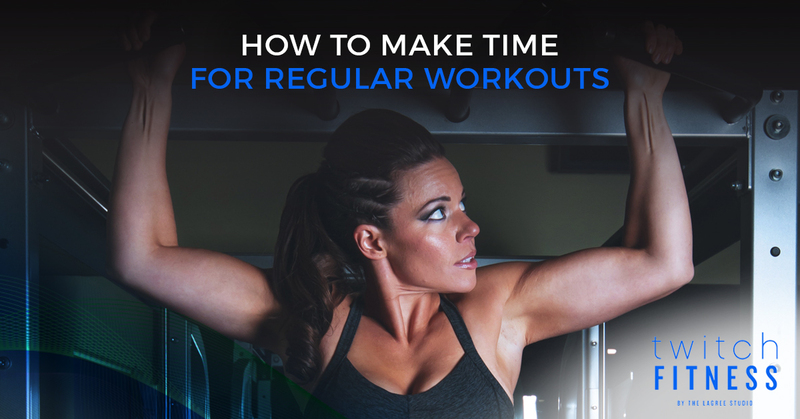 If scheduling can’t-miss workout times will make you get to the gym, then by all means, do it. By the end of work, you’re probably hoping to just get home or busy running errands. This makes it easy to fabricate excuses to not go to the gym. To combat this, wake up early and get your exercise in first thing. Even sleep in your workout wear if you must. While you might be thinking this will surely make you exhausted throughout the day, regular exercise actually gives you more energy. Not only that, studies have shown that exercise can improve your quality of sleep, meaning you may not even miss that extra hour. While many of us claim we have no time to go to the gym, we usually have time to, you know, sit around and watch TV. We get it. If you get off of work late, sometimes you don’t want to go to the gym. After a long week, you just want to relax on the couch – that’s fine. But find times to squeeze in exercise. Walk up and down a staircase or do jumping jacks during commercials. Jog in place while watching Stranger Things and pretend you’re running away from the monster – we won’t judge. Maybe you have been skipping the trip to the health club to spend more time with your significant other. Why not bring them along? Sign up for the same group exercise class and get sweaty with your sweetie. Participating in a Twitch Fitness class with your significant other will strengthen your core and your relationship – it is a win-win situation. Standing in line at the bank? Do some toe raises to strengthen your calves. The kids are at soccer practice? Bring your tennis shoes and walk or jog around the field. In an elevator by yourself? Do some squats. Finding just a few minutes here and there to do little exercises might not have you dropping pounds left and right, but it will make a big difference in the long term. Looking for a calorie-torching, heart-racing workout that doesn’t take all day? Twitch Fitness, by the Lagree Studio, offers low-impact, high-intensity group exercise classes at our Austin fitness centers to help you reach your exercise goals. Our classes use the innovative Total Twitch Training (T3) approach to fitness to target both slow twitch muscle fibers and fast twitch muscle fibers to give you the ultimate total-body workout. Reserve a spot in one of our versaclimber or megaformer exercise classes today!